No one can write memoirs forever: there's only so much life to work from. Chatty showbiz books can keep coming out in endless numbers, I suppose -- dedicate one volume to each five-year span, and air-kiss everyone you saw in those years. But anything aspiring to a shape and scope and focus larger than that must have important events (even if they're entirely internal to the memoirist) to center each book around, and each life has only so many of those. Stephen Fry, for example, has neglected to include any such event in More Fool Me, his third and least book of memoirs. Moab Is My Washpot was a genuine artistic triumph, as strong as Fry's novels, telling the story of his teen years and in particular a self-destructive streak of credit-card theft that led to a short prison stretch at the age of seventeen. That was a clearly important event. And now the Fry memoirs come to his thirties, when he was even more successful. More Fool Me, though, has an ace up its sleeve: Fry was a regular cocaine user for fifteen years! Roughly from 1986 through 2001, he snorted powder cocaine pretty much every time he was out in public at parties and events. He explains that he's deeply introverted by nature, and only cocaine allowed him to be bubbly and sociable and on. And he's now here to tell us that cocaine is bad, and that we shouldn't do it. But the story he tells belies that advice. Yes, he does end up with a bit of blood from the nostrils a couple of times, and I remember one vomiting spell. But he doesn't lose friends, he doesn't lose work, he doesn't even seem to have a habit that causes him the slightest financial distress. (Rather the opposite, actually: he proudly declares that he only used cocaine as a reward after work, and implies that using it helped him make and maintain more useful professional contacts than he would have otherwise.) He keeps saying that he doesn't recommend cocaine, but then he tells the story of his life, in which cocaine allowed him to work very hard, to make and maintain strong contacts across a very chatty industry, and gave him enough energy to power frankly amazing days. All in all, More Fool Me is more a commercial for the power of cocaine than a cautionary tale. But worse is the fact that More Fool Me is a baggy monster. Fry starts off with a long initial chapter entirely composed of apologies and a canned (too-long) precis of the first two books. A more disciplined writer -- perhaps the Fry on cocaine who wrote his four novels in the '90s -- could have done this in ten pages; the Fry of 2014 takes fifty. Then he dives into cocaine, with a chapter on how horribly bad it is and all of the places he snorted it, and quietly tap-dances around the usual centerpiece of the I-was-addicted memoir: the story of bottoming out, losing important things, and turning his life around. Perhaps that will come later, the reader thinks. It doesn't. Fry then drops back into his pleasant and somewhat blathery mode to update us on his life in the late '80s and early '90s (busy busy busy, with the Bit of Fry and Laurie and Blackadder TV serieses, regular writing gigs for a number of publications, several movie projects, plus some political-consulting work). This all, I'm afraid, is in what a Brit like Fry might call the luvvy mode: everyone he worked with was smart and talented and fun and a joy. Some of them also did cocaine, but he carefully removes those names (though the reader can make some half-assed guesses based on who was in the company earlier in a particular evening). 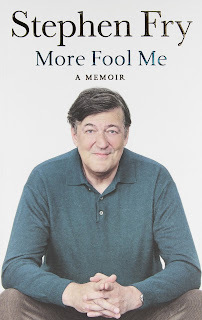 The last hundred pages of More Fool Me, in fact, consists of a very lightly edited diary from the autumn of 1993, when Fry finished writing The Hippopotamus (his second novel), prepared for a movie that didn't end up happening, and a whole lot of other things. The days are interesting, but there's no shape to the diary -- it begins on a random day and ends on a random day, giving a snapshot of Fry in the middle of his cocaine years without providing any structure or point to the exercise. And then modern-day Fry pops back in at the very end, to shake his head ruefully at his younger self, declare that chap did entirely too much cocaine and it's a wonder it didn't affect him in any detrimental way, and then closes the curtain. I don't know if Fry ever had any thought of giving this book the theme "I did cocaine for fifteen years, and it was an amazing boost to my career and only did very minor damage to my health." That would have been something new and different, but it also may not be entirely true. (Fry says he stopped using cocaine about 2001, but not why -- perhaps he does have a bottoming-out story to tell, which he's husbanding for Memoir #4.) But the book he did write is at best a curate's egg -- lots of good words and sentences and paragraphs, pleasant show-biz reminiscences, and an engaging voice, all wrapped up in a lack of structure and a clear Do As I Say, Not As I Do tension.